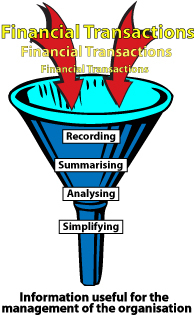 Accounting is a process in which money transactions are recorded, summarised and analysed so as to produce information for a variety of purposes. That sounds a pretty boring explanation so let's try again. Is business making any profit? Have I got enough money to pay my bills? In order to answer these important questions, you need to make sense of the hundreds, if not thousands, maybe even hundreds of thousands of financial transactions that might occur every year in regard to your business. Accounting is a vital and necessary process for businesses and individuals. It is not everyone's idea of great fun, but without accounting the world as we know it, would not exist. The birth of capitalism owes its existence to accounting. When businesses fail to administer proper accounting processes it is usual to find that the business does not survive. Furthermore, when accounting processes fail it is not uncommon to find that businesses will become embroiled in law suits.